Autumn is a fantastic season, with a bright array of vivid warm colours such as oranges, reds and yellows. It’s a process where leaves start to die, but for a photographer, they actually come to life. At the height of summer, with the exception of heather season, the landscape becomes drowned out with a limited tonal range of green. 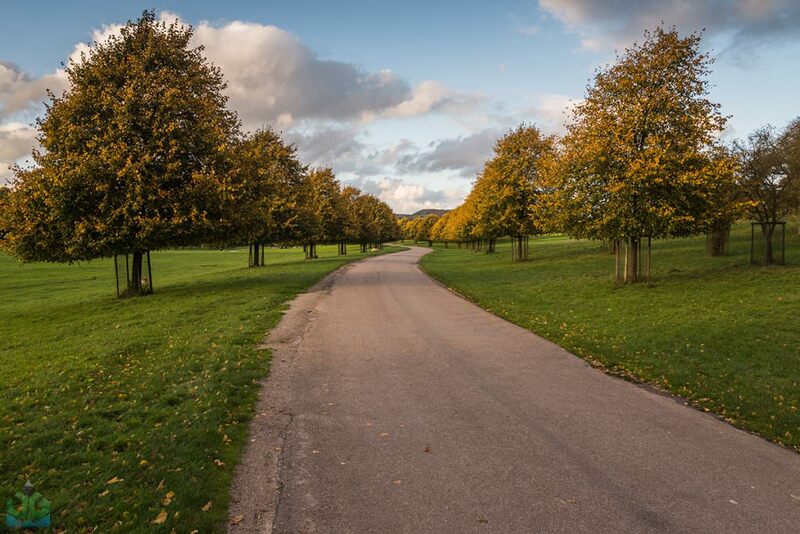 Autumn transforms the look of this landscape before the onset of winter and even a simple drive down a road with falling leaves and the smell leaves you feeling invigorated. Another great thing about Autumn is the variety of photos you can take. You have intimate woodlands, gushing cascades and grand vistas. If the weather is poor, you can often go out and shoot some of the best scenes as a bright overcast sky acts as a huge diffuser and makes shooting things like waterfalls much easier without bright spots. 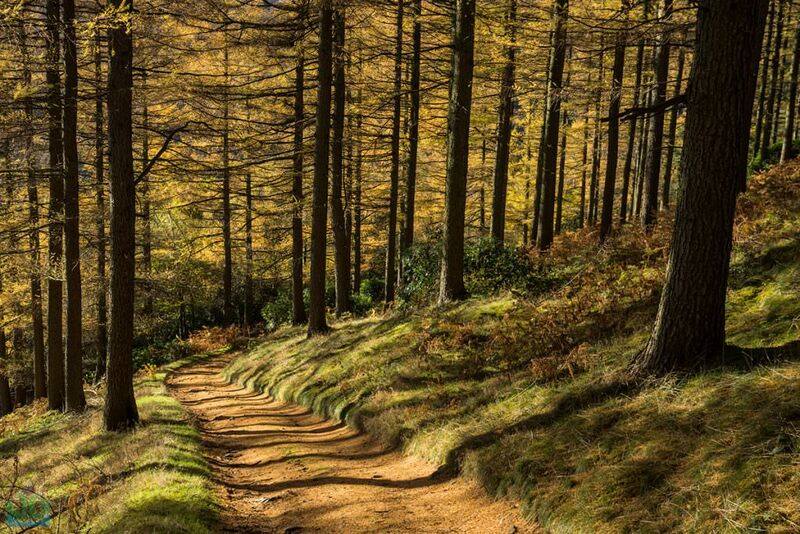 Here SNAPP Pro photographer, James Grant shares some of his top spots for capturing autumn colours in the Peak District. 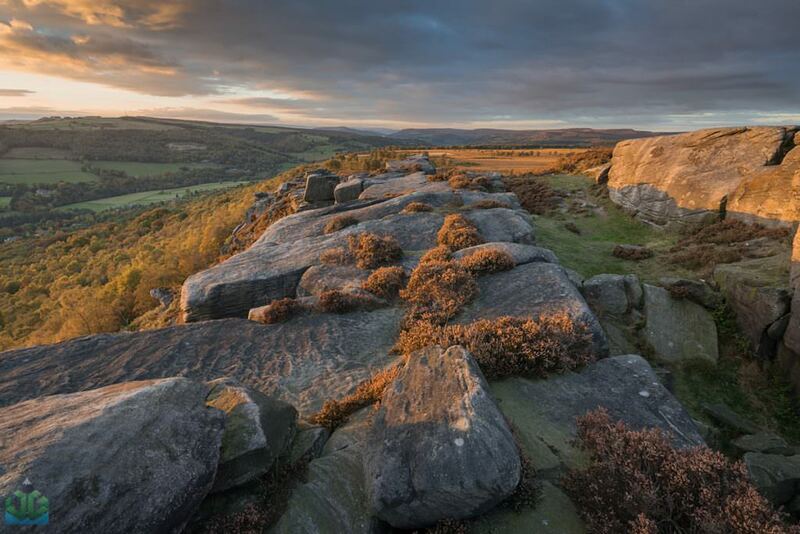 Full details of these locations together with GPS coordinates, as well as local and creative tips can be found in his app-based SNAPP Guide to photographing the Peak District. 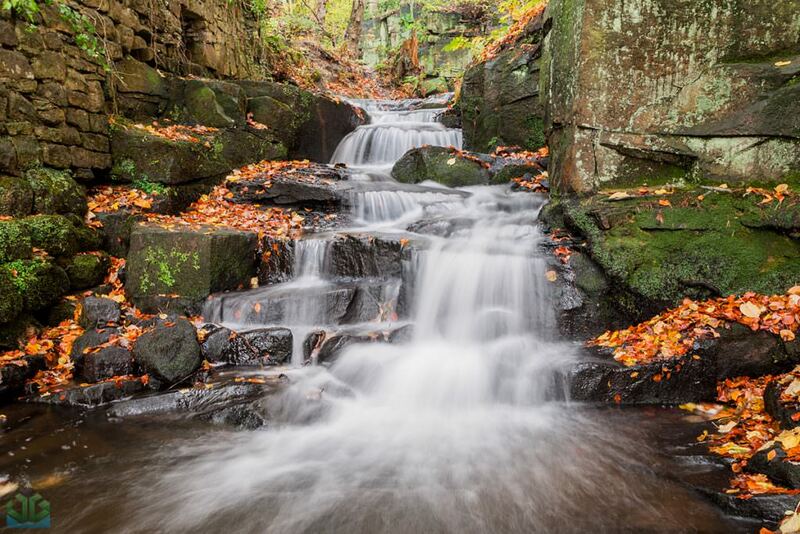 I don’t know why but when I think of autumn photography, I think of waterfalls first. I love orange leaves surrounding gushing cascades of water. 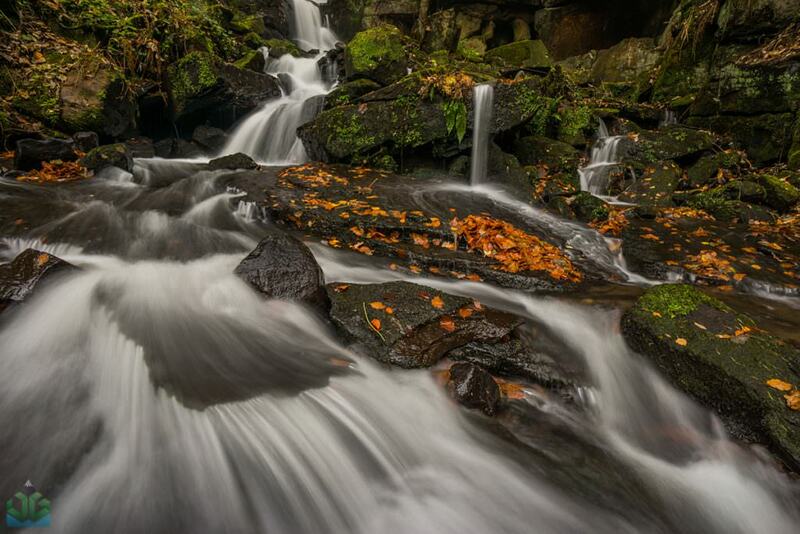 Unfortunately, the Peak District isn’t the most populated with waterfalls but we have some lovely examples, Lumsdale near Matlock being my absolute favourite. 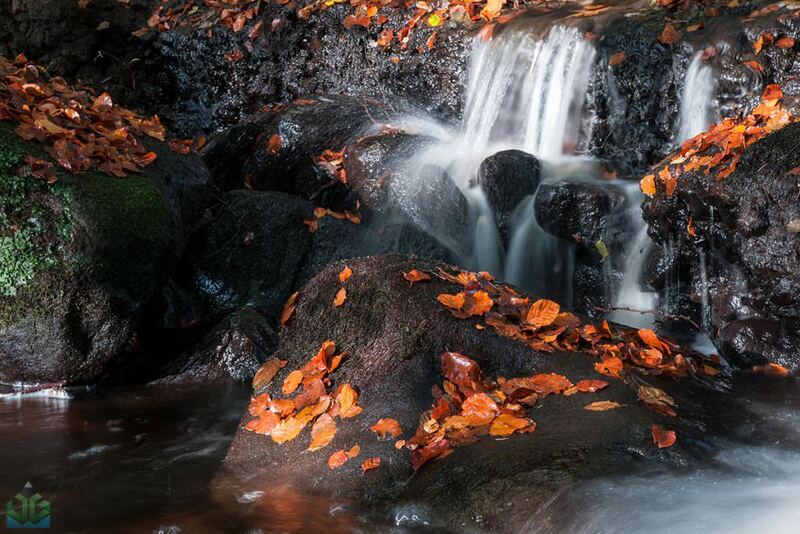 1: Use a polariser when photographing waterfalls to cut glare off water and leaves. Some of the shots below were taken without one and you can see the obvious differences. 2: Check the progress of autumn foliage falling throughout the season as it varies year to year. I tend to find the first week of November is the prime time when there are just enough leaves left on trees but plenty of fresh leaves on the ground. 3: Take wellies to get into the water for unique compositions. Lumsdale is my favourite location for Autumn. 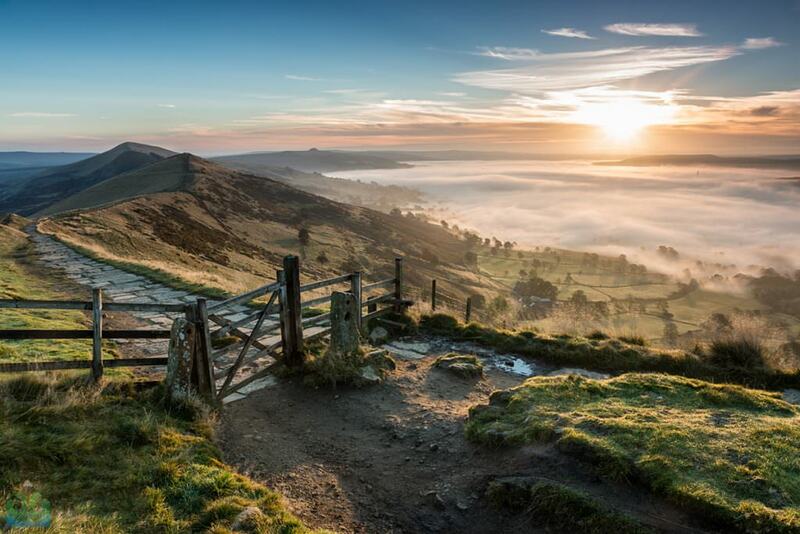 It’s located just outside of Matlock, so technically doesn’t fall within the Peak District but with beauty like this, it would be foolish to exclude it. There is a series of waterfalls, some man-made with a millpond at the very top. The area is steeped in history and is part of the Arkwright Society and there is evidence of ruined mills scattered along the grounds. 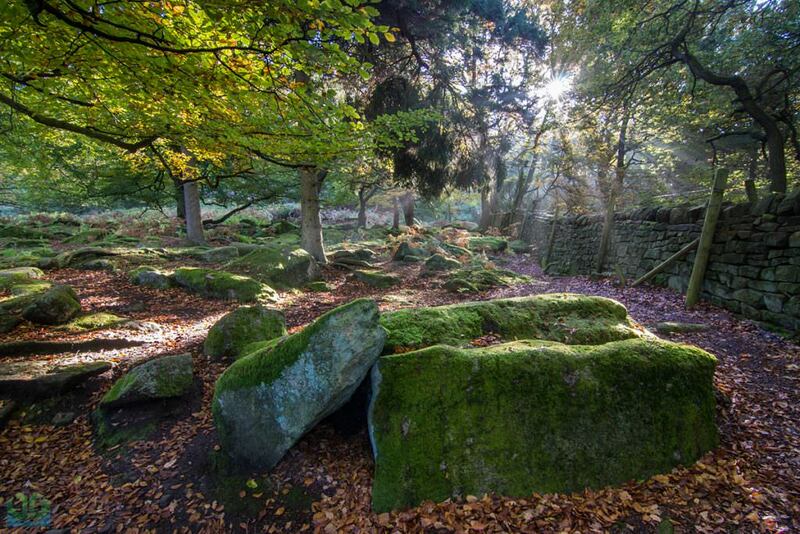 Next up we have Padley Gorge. 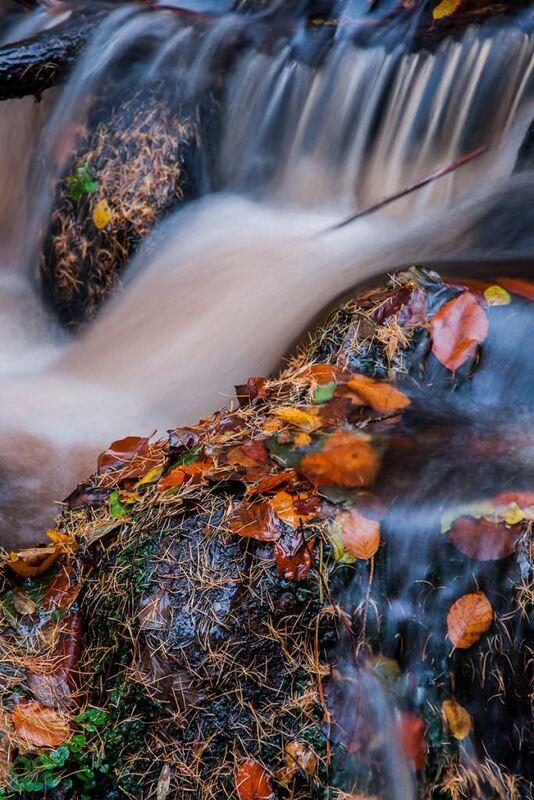 Padley Gorge is probably a Peak District photographer’s go-to location for autumn photography. Whilst not my personal favourite, it’s a great spot for those who would like to combine both water and woodland into one trip in my opinion. Below is an image with some rich vivid beech leaves with a small cascade. Sometimes it’s good to focus just on the details. 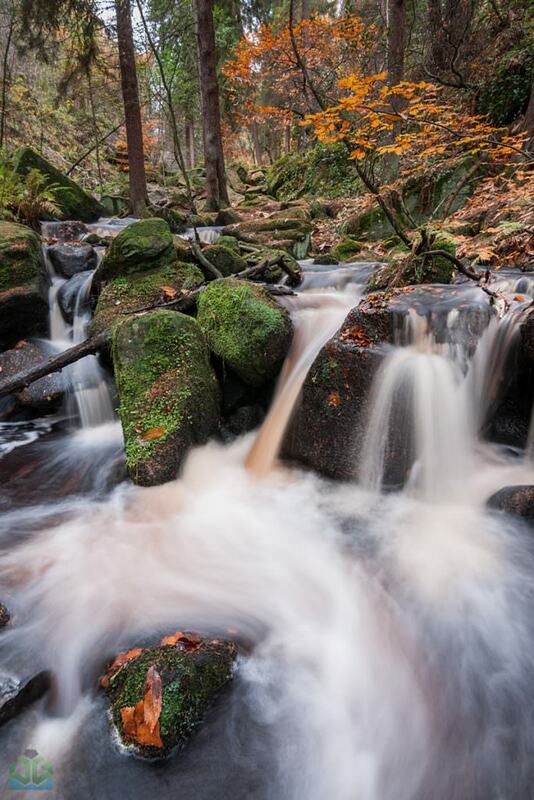 There is another image later on also from Padley Gorge if you’re interested in what else surrounds it. Swallet Falls used to be a relatively unknown waterfall between Eyam and Foolow. 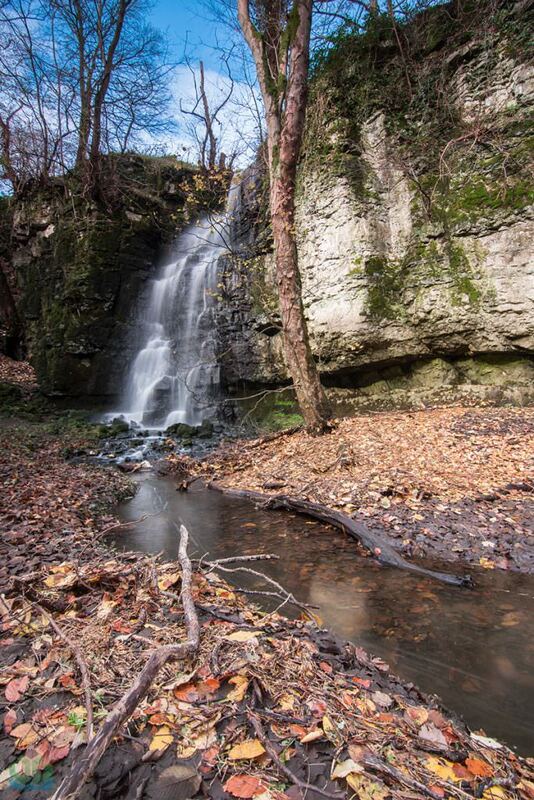 Driving or walking along the road, you’d be hard pushed to see or hear this waterfall as it’s located in a big hollow. However, what you soon discover is you’re presented with one of the Peak District’s biggest and best waterfalls, that is if it’s been raining recently! The waterfall comes from a tiny stream and suddenly drops off the rock face and forms a huge cascade before running underground towards Eyam. Head here if it’s been a miserable week of rain and you’re sure to be well rewarded. I am definitely planning to go back here again. Please note parking along the road is very limited and parking may be better off done in Eyam. The land used to be privately owned but was sold off to the National Trust and access can now be gained by the public. It is however a slippy descent down the hollow so please do take extra care if you visit. Finally, another great spot is Wyming Brook. I much prefer this to Padley Gorge, it offers bigger cascades and a bigger stream. The only downside is the confined area it is in. Located just outside of Sheffield, this short brook is a great area to explore and well worth checking out if you don’t fancy clanging tripod legs with another photographer. I have to admit, woodlands are one of my weaker suits. I find a bunch of trees a complicated mess and can never quite achieve some of the results you see regularly posted but hopefully some of the below shots do some of the Peak District Autumn woodland justice. 1: Don’t use too wide of an angle lens. Keep focal lengths to 35mm and above so trees don’t become distorted and you can compress the scene. 2: Try to place a tree trunk on each side of the image to act as book marks to stop your viewer’s eyes wandering out of the picture. 3: Looks for shapes to draw people through the image or repetition to simplify the image. 4: Watch and observe how the trees turn day by day and use social media to gauge too. The best of autumn is over within a week and if you have a windy day the leaves get knocked right off the tree and it’s goodbye autumn for another year. 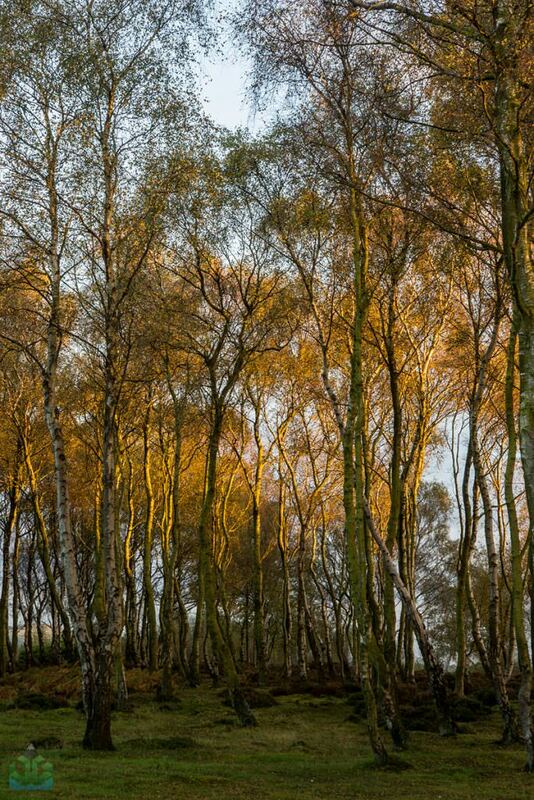 First off, Birch Trees are always a great subject. 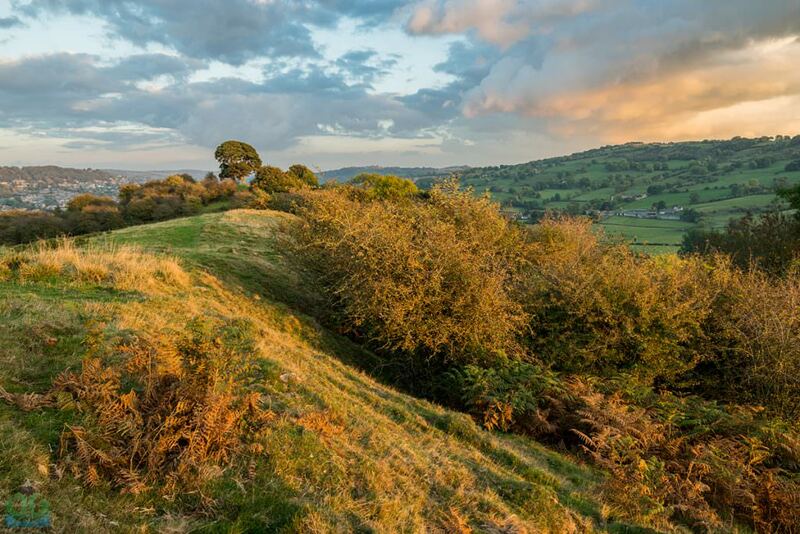 The white trunks contrast well against the fiery orange leaves, especially during a sunset such as this first shot below on Stanton Moor near the Nine Ladies Stone Circle. Next we move onto one of my favourite autumn photos I have ever taken. This is nestled in amongst some Canadian Fir trees above Derwent Reservoir on the path to Nether Hey. Ladybower and the surrounding Derwent Valley is such an awesome place in autumn which the plethora of native and none-native trees enclosing the valley, turning colour at different times of the season. 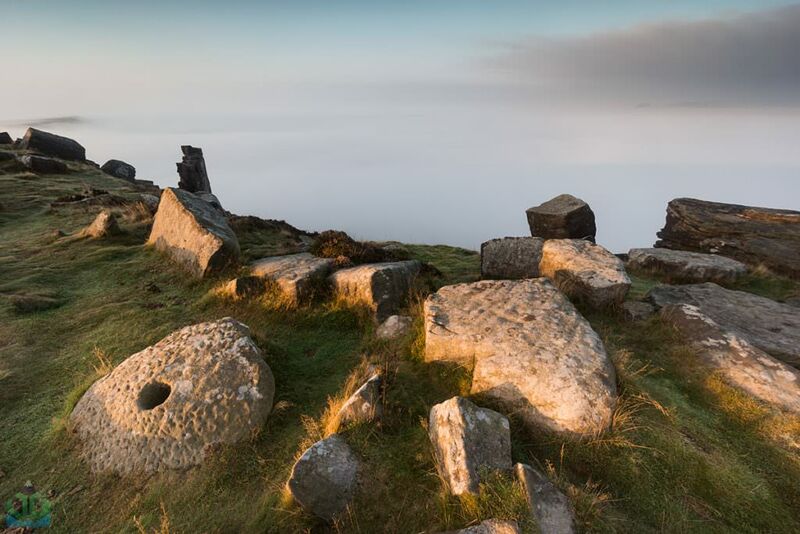 Finally, we are back to Padley Gorge and a shot taken early Autumn after a sunrise on Mam Tor. If there’s been mist hanging around in the valleys in the morning it could be worth heading into woodland after. As mist floats through the trees and the sun gets high enough to enter, you often get rays of light beaming through. Dreamy. Autumn signifies the start of mist season. It’s not just about the turning of the leaves. 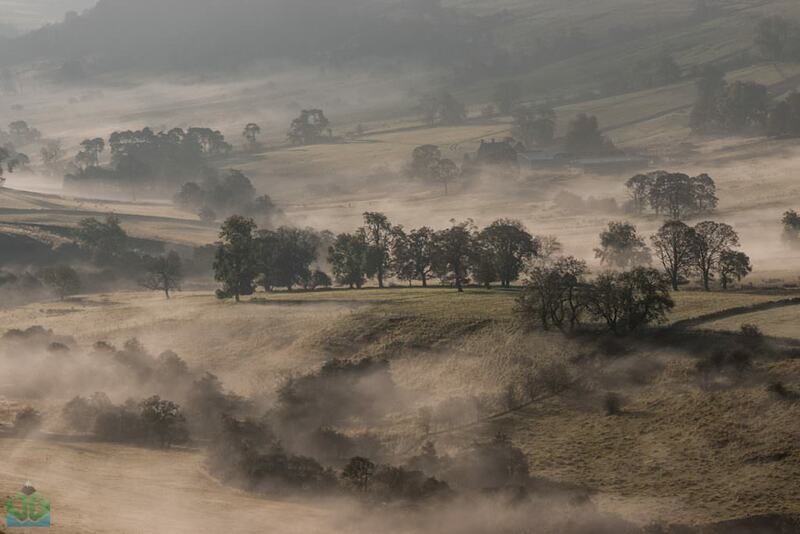 The cooler nights often helps mist form in key areas such as the Hope Valley and Derwent Valley. 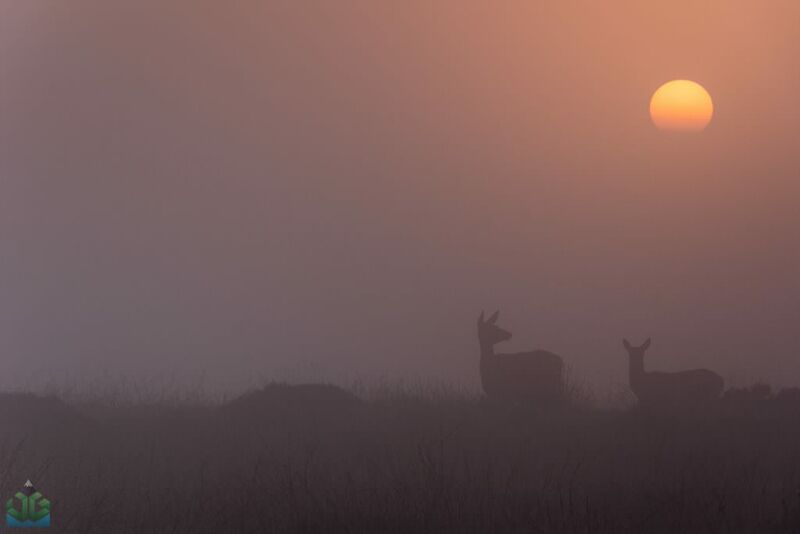 1: Wait for cool clear nights as this is the most common time mists will start to form in valleys. And lastly, mist floating amongst trees is always a great shot to grab. This is of the Dove Valley near Crowdecote. As I mentioned before, bodies of water develop mist just as the River Dove did here. Finally, we get to grand landscapes. Autumn can sometimes be hard to capture in context with a grand landscape but there are certain areas where evidence of Autumn is in abundance and below are some of my favourite spots. 1: As mentioned above, you have to time when the leaves are at their best by observation and through using social media. There is usually a week’s window where they are stunning but any bad weather with strong winds will knock the leaves right off leaving you to wait until next year. 2: Try to include as much of the autumn colour in your photo as possible without detracting from the other features of the area. Ensure compositions still remain strong. 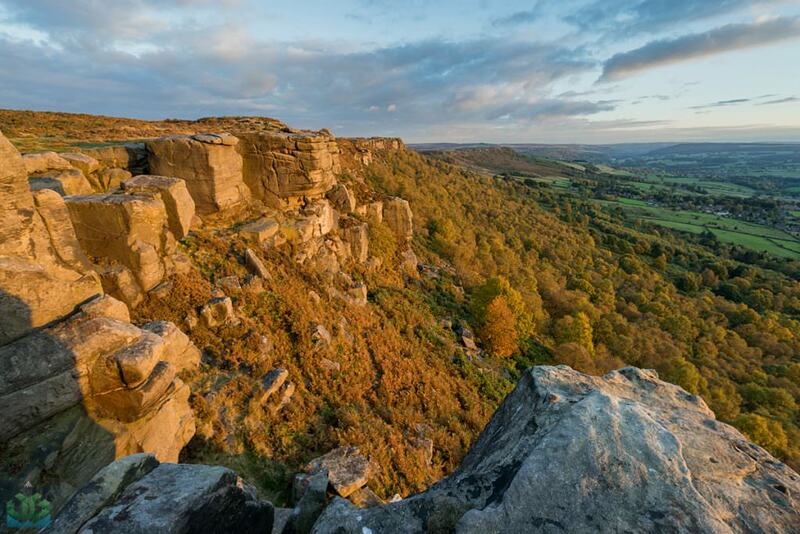 Froggatt Edge is one of the edge’s that seems to get left behind photographically, but in my opinion at the height of Autumn the trees below the edge turn in to a fiery spectacle it would be rude to ignore. I have visited here a couple of times now and caught a stunning sunset last year. I think I might return again this year too. This image perhaps isn’t grand landscape per-se, but Chatsworth House is a fantastic place to visit in Autumn. The estate has such a plethora of different trees that really come to life you could spend many photo sessions here. This shot below is of an avenue of trees on one of the private roads exiting from near the house.